In mid-August 1943, 24-year-old Celia Szapka boarded a train in Newark, New Jersey, carrying a suitcase and wearing her brand new I. Miller shoes. She knew she was traveling for a job helping the war effort — she had been working on a mysterious “Project” in New York City for the past few months — but she did not know where she was going or how long the journey would last. Hours later, the train rolled into Knoxville, Tennessee, where it was met by a car that whisked Celia and several other young women to a muddy, makeshift encampment tucked into a bend in the Clinch river, a site that would eventually sprawl nearly 100 square miles. Tens of thousands of people, many of them young, single women, would converge on the site over the next two years, doing their part to advance what would become known as the Manhattan Project, to develop the world’s first atomic bomb. 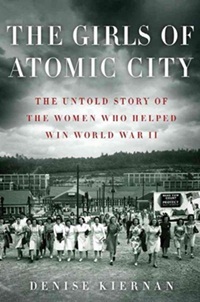 Denise Kiernan’s The Girls of Atomic City shares the story of these young ladies. An extraordinary work of journalism, biography, and scientific history, Kiernan’s book explains the origins and life of Oak Ridge, Tennessee. She interweaves the stories of the women who worked there with the parallel “life story” of uranium, known as “tubealloy” — its discovery (focusing particularly on the role of female scientists), enrichment, and use in the bomb. The separation of these stories is signaled by the use of different typefaces to tell each story, underlining the essential secrecy of the work at Oak Ridge, and the necessary ignorance in which its 75,000 residents lived. Kiernan’s characters represent a cross-section of the society of Oak Ridge: women of different racial and class backgrounds, whose roles ranged from janitors, nurses, and secretaries to mathematicians, chemists, and physicists. Most of these women, now in their seventies and eighties, were interviewed by Kiernan in the process of her research, and she skillfully mimics their voices, with their distinctive turns of phrase and dialect, to make their stories come alive. A cast list at the beginning of the book (of people, places, and “things” like tubealloy) helps to keep the different characters straight, and also emphasizes the unreal, theatrical nature of this temporary city, in which secrecy bred a strange kind of coded language. In addition to Celia, we meet and follow Toni Peters, a local Tennessee secretary, who first hears of the Project through the government’s program of forcible requisition of property — her aunt and uncle’s farm is seized to make way for Oak Ridge, and like many of their neighbors, they are faced with a long, uphill fight for adequate compensation. Kattie Strickland, from Auburn, Alabama, is enticed to find work at the plant by the prospect of decent wages, despite the racial discrimination that forces her to live apart from her husband and prevents her from bringing her four children with her, although there are schools on site for white children. The upright, ambitious Jane Greer, who is “rudely yanked out of line” at the University of Tennessee and told that women cannot matriculate as engineering majors, instead trains as a statistician. She goes on to oversee a team of female mathematicians working around the clock to track production rates at Y-12, the electromagnetic separation plant at Oak Ridge. A large part of the drama of the story, of course, comes from what we as readers know all along about the site’s purpose — and what the women working there do not know. The book opens with a prologue, “Revelation,” dated August 1945, which dramatically depicts the wildfire conversion of “the Secret” into “the News”: “Slowly the entire Reservation was igniting, ripples of information expanding outward via word and wire.” But the story of Oak Ridge doesn’t end with the bomb, or the end of the war that spurred its development. The atomic city’s population dropped after 1945 but soon ramped up again, with the advent of the Cold War and the nuclear arms race. Oak Ridge was placed under civilian control in 1947, and its gates, identification badges, and checkpoints were removed to turn the place into something closer to an ordinary town, yet much of its secrecy and notoriety remained in place. Kiernan briefly traces the postwar fortunes of her central characters, and the changing attitudes to what they unknowingly created in their mysterious wartime home. It’s clear that those years were formative and unforgettable for the women who survived them — years when domestic and military life were entwined, and when, despite their gender, they were entrusted with their government’s most important work. By focusing on the details of their everyday lives and vividly evoking their different characters and personalities, Kiernan gives Celia, Kattie, Vi, Jane, Toni, Dot, and their thousands of peers the testament they deserve — without at any point losing sight of the devastating consequences of their work.